What comes to mind when you think of the Caribbean? Warm sand and sea turtles? Long walks on the beach, breathtaking turquoise water…tiny umbrellas? For me it's wild goats. During my first trip to the French West Indies (1998), an avid swimmer, it was a thrill for me to finally swim over sea turtles and stingrays. But I was especially enchanted by the hilarious plucky goats I spied frolicking in rocky hills above as I swam laps below. At once boney and chubby, they are an ideal subject for abstraction. St-Barth Cabri, my newest (and second) goat sculpture is a tribute to these intrepid ungulates; a nod to the undaunted spirit of their human neighbors, tirelessly rebuilding after unprecedented damage from this year's hurricanes. 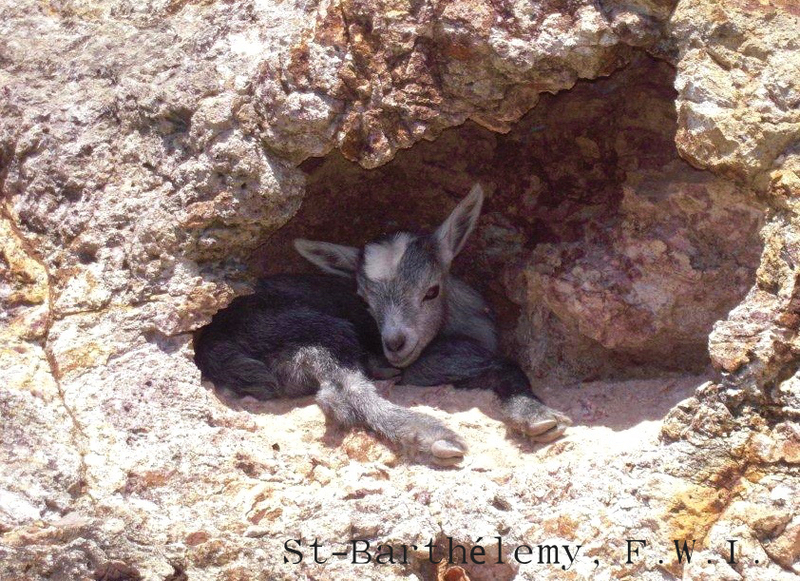 A kid goat ("Cabri"), nestled into a shallow cave in the craggy hills between Gouverneur Beach & Saline Beach. The wax prototype of my new West Indies goat sculpture (approx. 12 inches high).